If you happened to have read my post about Abe Lincoln's birthday you'll know that I'm a little obsessed with him. I have dozens of Lincoln books (not all cataloged in my LibraryThing yet) and my wife thoughtfully got me another one for Christmas. I've got his bust, modeled after Volk's life-mask, staring at me on my desk. Once in school, when we were assigned to produce a poster symbolizing ourselves, mine had a little "trinity" of my ultimate heroes at the top: Jesus (higher than the other two, of course), Da Vinci, and Lincoln. I might still have it around somewhere. And every time they discover some new bit of Lincoln memorabilia or publish some new theory, I'm there. So yesterday was Lincoln Heaven because two samples of Lincoln trivia turned up on the same day. First, Ulysses S. Grant's great-great-grandson was going through an old picture album and found a photo that says it's Lincoln standing in front of the White House. You've got to understand: There are only 130-something Lincoln photos in existence and none of them show him outside the "Executive Mansion" as they called it back then. The man in this picture is very tall, dresses like Lincoln, and has a beard, but the picture is so tiny and distant that you just can't say for sure. 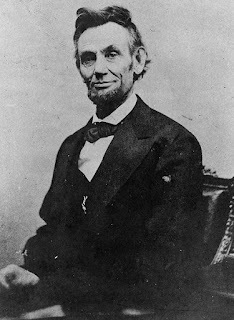 If it is Lincoln, it may be the last photograph taken of him though. Just a few days after this picture was made he was shot at Ford's Theater on April 14, 1865. Meanwhile, there was another gentleman in the 19th century named Jonathan Dillon who also has a great-great-grandson poking around in Lincolnania. Mr. Dillon, a watchmaker by trade, used to tell his relatives a story: Back in April 1861, he would say, he was busy fixing a watch for the new President, Abraham Lincoln, when a friend burst into his shop yelling that the south had attacked Ft. Sumter. That was the event that officially started the Civil War, of course. According to Mr. Dillon this news moved him to secretly emboss an inspiring message inside the President's watch. When he finally got around to telling this story to the New York Times back in 1906 he remembered his message as saying: "The first gun is fired. Slavery is dead. Thank God we have a President who at least will try." Mr. Dillon's great-great-grandson convinced the Smithsonian Institution to open Lincoln's watch yesterday, and when they did it turned out that the old fellow wasn't just making up a whopper. There really is an inscription in there, although it runs a bit differently than he eventually remembered. What he really wrote was: "Jonathan Dillon April 13-1861 Fort Sumpter was attacked by the rebels on the above date. J Dillon April 13-1861 Washington. Thank God we have a government. Jonth Dillon." Everybody spelled Ft. Sumter wrong back then, even Mr. Lincoln.